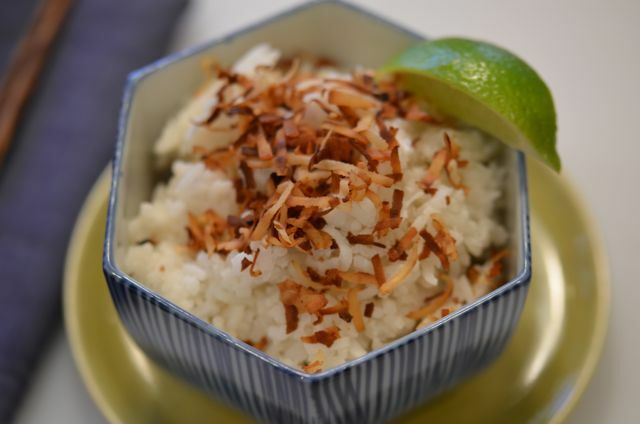 Well, our trip to Hawaii not only yielded some good tiki drinks, we found a really great side dish- coconut rice. 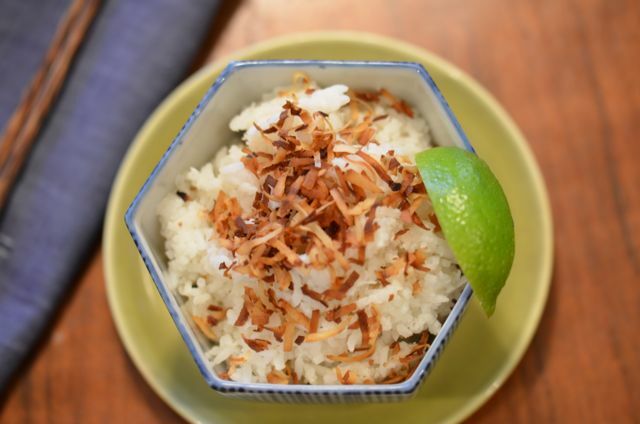 You may be familiar with coconut rice, as it is often served with Thai and Indian dishes, but it is a side that can (and we think should) be made as a regular side-dish at home. 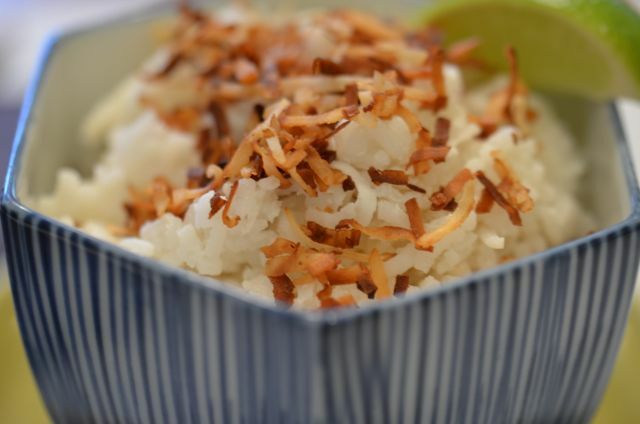 Coconut rice simply combines jasmine rice, coconut milk, water, oil, salt and some shredded coconut. Coconut rice, as you would expect, is a bit sweet but it is by no means cloying. The sweetness actually creates a nice match with main dishes that are a bit spicy, sour and/or acidic- so the coconut rice turns out to be a very versatile dish. So if you are making curry, fish or shellfish, a spicy stir-fry or even a roast chicken , the coconut rice will be a great side, and certainly a nice break from potatoes. (And most kids love the sweet rice). Coconut rice is also easy to make and you can find most of the ingredients in any supermarket. To make the rice, simply oil a medium pot then, over medium-high heat, add the remaining ingredients and bring to a slow boil. Stir regularly for the first few minutes to avoid sticking. We also use extra shredded coconut to toast for garnish- but this is optional. Once you reach a boil, add a lid to the pot and simmer for 15-20 minutes, or until most of the coconut milk is gone. Then remove the pot from the heat, but keep the lid on for 10 minutes. After 10 minutres check the rice for seasoning (add salt of needed), garnish with toasted coconut and/or a lime wedge (if you like) and serve. We’ve served coconut rice with buttermilk roasted chicken (very good match with the tang from the buttermilk marinade) and also with roasted Mahi-Mahi with a butter / lemon sauce (both recipes soon). We also reheat the rice and serve with mango, papaya, lime and some sesame seeds as a light snack (dessert? ), it rocks. So unlike most leftover rice, coconut rice leftovers are worth keeping. Finally a few notes on the recipe. It is adapted from a few internet sources and an article from Darlene Schmidt in thaifood.about.com. We do tinker with the recipe, including using sweetened coconut (why not?) and the option of using lime to finish the dish- we like the nice touch of acidity. We also add the toasted coconut as garnish, which looks and smells greats and adds a nice crunch. Give this one a try. The recipe calls for vegetable oil or coconut oil. If using vegetable oil, use a neutral-flavored oil like canola. Olive oil may taste off in this dish. We use sweetened shredded coconut, but unsweetened is fine too. It is a small difference in the final flavor- just a bit sweeter. What You Get: Easy, tasty rice that is a great fit for Asian flavors and spicy or sour western dishes. What You Need: No special equipment needed. Coconut oil is nice, if you can find it, but vegetable oil is a good substitute. Make sure to use a pot with a tight-fitting lid. How Long? 25-30 minutes with a few minutes of active time (mostly stirring). Coconut rice is an easy, anytime dish. Rub the oil over the bottom of a medium-to-large, deep-sided pot. Place the rice, coconut milk, water, shredded coconut, and salt in the pot and set over medium-high heat. Stir frequently in the first few minutes to keep rice from sticking to the bottom of the pot and burning. Once the coconut-water has begun to gently bubble, stop stirring and reduce heat to low. Cover the pot with a tight-fitting lid and let simmer 15-20 minutes, or until most of the liquid has been absorbed by the rice. To check doneness, pull rice aside with a spoon and check for liquid in the pot. If most of the coconut milk-water is gone, go to the next step, or cook until most liquid is absorbed. When ready to serve, remove the lid and fluff rice with a fork or spoon. Taste for seasoning and add salt if needed. Serve with toasted coconut and a lime wedge, if you like. To Toast Coconut: Place 1 Tbsp. dry shredded sweetened (or unsweetened) coconut in a frying pan over medium-high heat and stir until golden brown. Remove the coconut immediately from the pan when ready (it will burn quickly if left in the hot pan- even if the burner is off). Wonderfully aromatic with a subtle coconut flavor. Highly approved by islanders and haoles! Thanks – i like the simple but good flavors/ appeals to adults and kids – and don’t forget the lime…. nice. thank you for sharing. Thanks for posting this! I have a great chicken curry recipe (I just posted it yesterday) that I serve with green rice, but the coconut rice sounds like it would go well with it, too. I’ll definitely try it next time I make curry! I’m definitely following this blog! The only downside is that it makes me so hungry! Keep up the good work! this would go so well with turkey and chutney…yum…thank u! Finally made this–tonight. Because I didn’t have all the ingredients for my original idea to pair it with (macadamia crusted tilapia with white chocolate sauce) I found another recipe that turned out to be a fantastic complement with the coconut rice–Brazilian Fish Stew (with some minor changes) over on yummly. Thanks again…and as I keep saying, keep em coming.